Where is 3D NAND technology headed? TLC NAND flash storage devices wear out quickly, and they're not as fast as MLC or SLC. But TLC devices are a good choice for tier 2 storage and read-heavy applications. to other types of flash memory. But TLC is not general-purpose flash storage. Triple-level cell (TLC) NAND flash memory is designed to store three bits of data per cell. 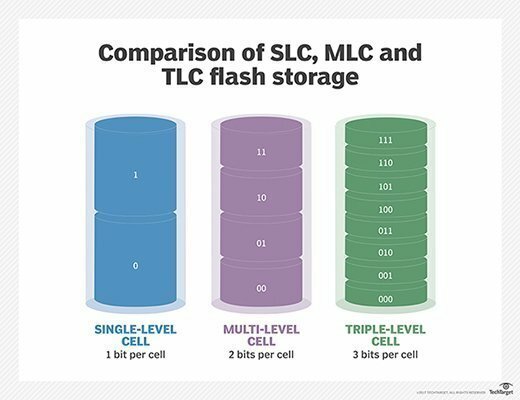 A TLC flash device can accommodate 50% more data than a multi-level cell (MLC) device that has the same number of cells. Storing a larger amount of data in each cell reduces the cost per GB of flash storage. 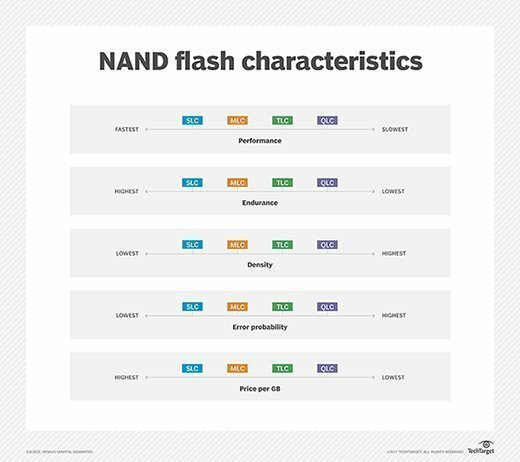 Not all of TLC NAND flash memory's characteristics are positive. Because each cell accommodates three bits of data, the cells can wear out more quickly. 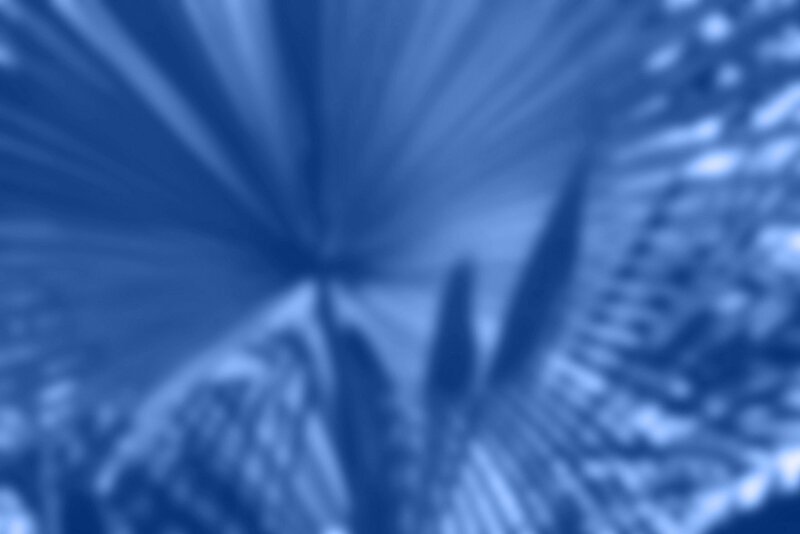 Increasing the number of bits that can be stored in a cell also increases the chances that the cell will be written to more frequently than it might if it could accommodate less data. Plus, TLC NAND is slower than flash storage devices that store fewer bits per cell. Storage administrators must consider these characteristics when determining which workloads to pair with TLC NAND flash storage. The performance and durability issues of TLC NAND flash memory might seem to mitigate the benefits, considering that raw performance is what drove interest in flash storage in the first place. But TLC still outperforms spinning magnetic storage media. There are several viable use cases for TLC NAND flash storage. Scientists performing research at high altitudes, in space or in space analog environments often record data to TLC NAND flash memory devices because they are not as sensitive to vibration or changes in atmospheric pressure as spinning disk. The same can be said for single-level cell (SLC) and MLC storage, but TLC storage is cost-effective and is often better at accommodating the quantities of data produced with scientific research. Many consumer devices, such as tablets and laptops, also use TLC storage thanks to TLC NAND flash memory's low cost and high capacity. In the data center, TLC storage is best suited to read-heavy workloads. NAND cell wear only occurs with write operations, so applications that read data frequently but make comparatively few writes are well-suited for use with TLC flash storage. TLC NAND flash memory is also suited for use as tier 2 storage. Multi-tier storage architectures commonly use low-capacity, high-performance flash for the first storage tier and slower, higher-capacity flash for the second tier. The idea is that the system can dynamically move hot blocks to tier 1 storage and keep cool blocks on tier 2 storage. This architecture ensures that the highest-demand data is placed on the highest-performance storage media. At the same time, data that users do not access as often can reside on higher-capacity, less-expensive media. The first storage tier can also act as a write buffer. When data is written to storage, the data can be initially written to tier 1, which has the performance necessary to quickly commit the data. When there is a lull in activity, recently written data can be dynamically moved from tier 1 to tier 2 storage. Which workloads do you use TLC NAND flash for?